Many elderly people find it too difficult to use a conventional mobile phone despite the vital lifeline it can provide. Designed to be incredibly simple and easy to use, the Doro Secure 580 Amplified Safety Mobile Phone with Alarm Trigger 3500 is a fantastic option for elderly people who need extra help and security when they're out and about. The phone features four speed dial keys for fast dialling of important friends and relatives. These keys help to eliminate the risk of dialling the wrong number and enable you to contact those most important to you quicker. 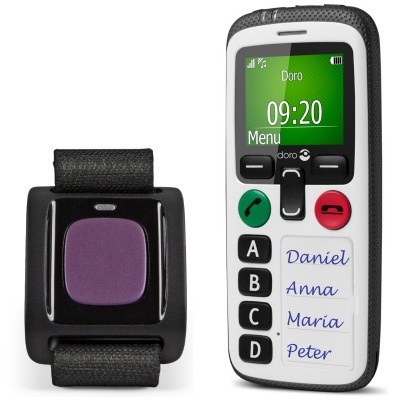 What's more, the Doro Secure 580 also features space to write the names of the contacts next to each button, so they can be more easily identified. This phone also features a loud receiver with amplification up to 35dB making phone conversations much clearer for elderly individuals with hearing difficulties. The Doro Secure 580 also features a loud ringer with a volume up to 87dB so that incoming calls can be heard and picked up much more easily. It also features hearing aid compatibility to ensure call clarity for all users that are hard of hearing. The emergency assistance button on the Doro Secure 580 enables the user to get help fast in the event of an emergency. When the button is pressed, the phone will send a text to all four numbers with the phone's GPS location, and will call the first number on the speed dial list and set the mobile to speakerphone so the emergency can be quickly communicated. Alongside the Secure 580's built-in emergency alarm, a Doro Alarm Trigger 3500 is also included. 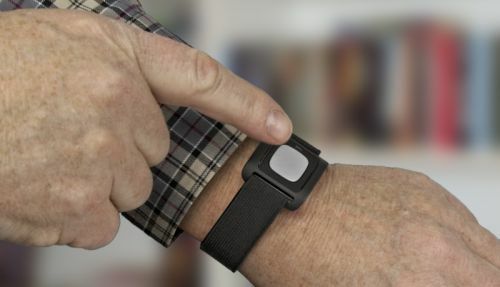 Worn on the wrist or around the neck, it connects to the phone and gives an easy-to-access emergency button even when the phone is out of reach. Its discreet and lightweight design makes it easy to wear, and it's waterproof design (rated to IP67) means it can even be worn in the shower or bath. The Doro Secure 580 is designed to be incredibly tough and durable, and is even splash-proof (IP54) to ensure that it can withstand almost anything thrown at it – great for protecting the phone against accidental drops or tumbles.